MANILA, Philippines - Korean boy band Super Junior has successfully penetrated Japan's music market with massive attendance at their two-day concert and with the release of a new Japanese single. The boy band held their "Super Show 4" world tour at Tokyo Dome on May 12 and 13, which attracted an estimated 110,000 people, according to their agency. They achieved this despite that "Super Junior has neither made an official debut nor done any promotions in Japan, they held a solo concert at Tokyo Dome, the dream stage of artists," according to a post on SM Town Facebook page. As a lucrative music market, Japan has attracted K-pop artists in the last few years. In addition, Super Junior's new Japanese single "Opera" has topped Oricon's daily singles chart. "Opera," the boy band's third Japanese single, was released on May 9 and debuted at No. 3 on the chart with 54,331 copies sold. It held the No. 3 spot for four days then climbed to No. 2 on May 12 and to No. 1 on May 13. In total, the single sold 155,603 copies. Super Junior debuted in the Japanese market last year with the release of the Japanese versions of "Bonamana" and "Mr. Simple." On May 20, Super Junior will join other SM Entertainment artists at the SM Town Live World Tour III that will be held at Honda Center in Anaheim, California. 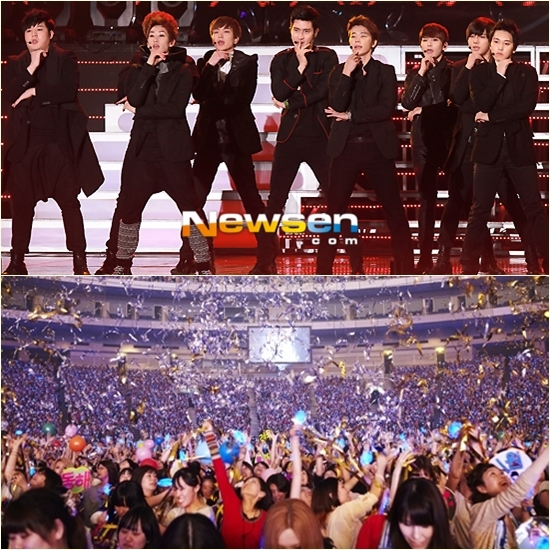 The boy band will hold the finale of their "Super Show 4" tour with encore concerts in Seoul on May 26 and 27.